While on a family road-trip last weekend, my niece and nephew decided that they absolutely had to ride in the car with me. Their mom had given me the Are you sure? look when I agreed, clearly not understanding what I was getting myself into. Ten minutes later, we were on the road, and twenty minutes later, I was ready to start pulling out my hair. I tried asking them to settle down at first, which only made them bicker and start pointing fingers at each other with accusations of who was the most annoying. In attempts to settle them down, I pulled the car over with some tricks up my sleeve. When I finally met up with the rest of the family at our destination, my sister was in awe when she saw that her kids were quietly snuggling in the backseat watching a movie. How'd you do it? she asked in amazement. I simply pointed at the mount I had installed on the back of my passenger seat headrest with my iPad attached to it. The USA Gear Vehicle Headrest Device Mount is a mount for the first generation iPad that is great for rear-seat entertainment like watching movies and browsing the web. With its adjustable grips, the mount easily attaches to any metal headrest neck, and has an articulating neck and 90 degree rotating head for users to view the iPad in their desired position. The iPad easily attaches to the mount with the included hard-shell case that also keeps my iPad well-protected while attached to the mount. When Im done using the mount, I can easily slide my iPad out and install it into my CaseScenario, a faux-leather folio that uses the same hard-shell case as the mount. 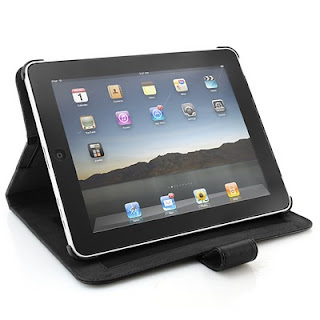 This folio case provides protection as well as comfortable and convenient portability for the iPad. The CaseScenario has several features that offer ultimate protection for the iPad. The folio comes with a sleek hard-shell case that can be used alone or easily installed into the folio for added protection. Its scratch-resistant interior protects the iPad's screen while the padded faux-leather exterior further absorbs impact from drops and bumps. In addition to providing safe and portable storage for the iPad, the CaseScenario is also designed for comfort. The folio folds into several different positions, providing added comfort for the user depending on what the iPad is being used for. When securely snapped into the folio, the iPad can rotate 360 degrees to be positioned in the user's desired position, making watching movies, playing games, and browsing the web as comfortable for the user as possible. Together, the USA Gear CaseScenario and Headrest Mount are designed to provide easy and secure portability, allowing users to maintain the iPad in the secure hard-shell case while switching between the portable folio and the headrest mount. The CaseScenario and the Headrest Mount are sold separately and each includes its own hard-shell iPad case. In addition, the Headrest Mount is also sold without the case for users who already have the CaseScenario. For more information on the CaseScenario and the Headrest Mount, visit http://www.accessorygenie.com/!